Update 2018: Pumphouse is currently closed. Updates to come. 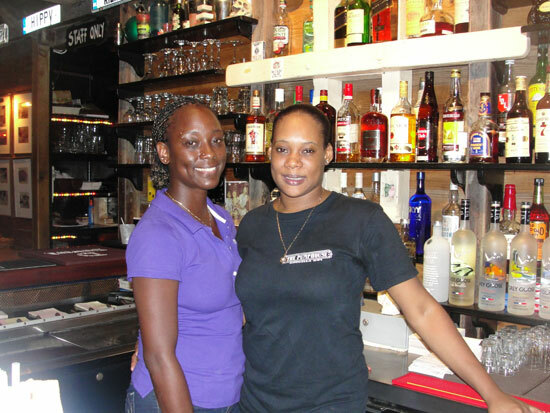 A funky, laid-back, musical hot spot, Pumphouse is one of Anguilla's most action-packed, fun, lively bars, and a can't-miss spot for dinner. Update 2017: Since the article below was written, Pumphouse changed chefs and dining concepts and later closed their kitchen to great dismay. The great news? As of 2017, Pumphouse's restaurant is back and it's better than ever! More on Pumphouse's restaurant and their NEW menu here. Chances are you have heard of The Pumphouse. 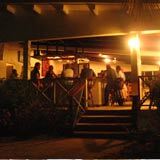 It is known as the place for live music and Anguilla nightlife. As far as I'm concerned, it is one of the coolest places to be! 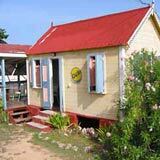 It is an open air building located on Sandy Ground on the salt pond side of the road. Sea breezes blow through, moonlight reflects on the salt pond... I love gazing at at the shimmering moon through the back windows while a live band plays. 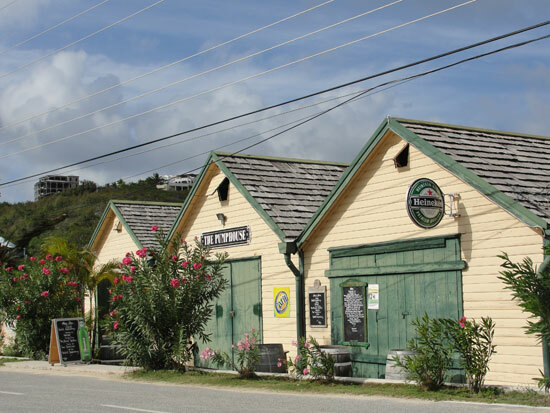 This Anguilla Restaurant Has a Vibrant Past! 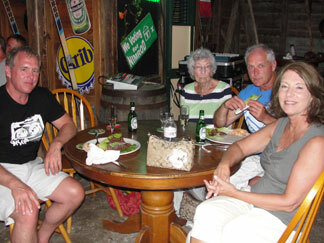 You are sitting amongst great Anguilla history when you dine at The Pumphouse! The Pumphouse is in a historical building which was used for many years as a mill for refining the salt from the Road Bay Salt Pond. The salt pond is just steps away from the back side of the building. Salt was once an export for the island of Anguilla. The Pumphouse parking area used to be a huge pile of salt, taller than the building, in fact! The Pumphouse we know today was once a working building, up until 1986 when salt exportation from Anguilla finally ceased. After a little less than a decade of a well-deserved rest, in 1995 Laurie Gumbs and his family opened The Pumphouse. It's been hard at work since, so you can sit back, relax, dine, drink, and enjoy life. The Pumphouse proudly displays some of the old mill equipment and old salt industry photos can be seen on the wall. 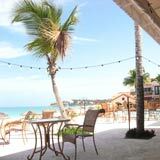 The remainder of the decor blends in and makes this Anguilla restaurant the fun and ever-funky Pumphouse loved by many! There are vintage signs on the walls. License plates from around the world are in the bathrooms and around the bar. 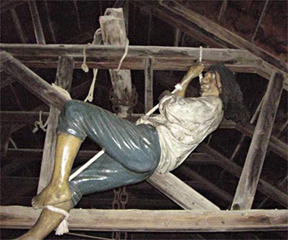 A life-size fiberglass pirate arrrrr ;-) hangs from the ceiling beam with a welcoming sneer. 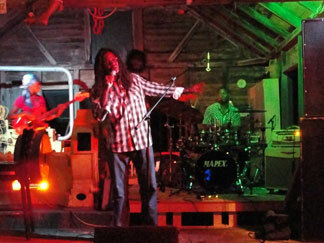 Click here to read about Nori's first Anguilla Restaurant Pumphouse night out! It is a special place, truly. I've spoken with many people who are just experiencing it for the first time. Everyone I've spoken with who has been to Pumphouse warmly recalls their amazing first experience. We all have this in common: tremendous first impressions and recurring good times whether it be a quiet, laid-back evening or a busy, night of live music. I will never forget my first Pumphouse experience. Back when I was coming to Anguilla as a tourist (today I live in Anguilla), my friends led me in late one night and as I took it all in, it was like a dream to me. The music was "pumping" and the people - locals and tourists alike - were dancing all around us as we walked in. It was a busy Thursday night and the unpretentious and remarkable interior, combined with the good energy of the people, set to the sounds of a local band has been a lasting fond memory. It seems The Pumphouse leaves a mark of a first impression because it is so unique, historical, and open to one and all. You only have to go there once to feel like it's a place to call home (in the Cheers sort of way, if you know what I mean). ... A home that has an occasional celebrity in attendance too! 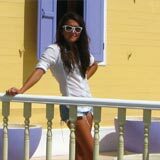 Click here to see Paris Hilton in Anguilla at The Pumphouse. As it goes, sometimes places for great nightlife aren't always noted for being fabulous dinner options - The Pumphouse is a delicious exception! 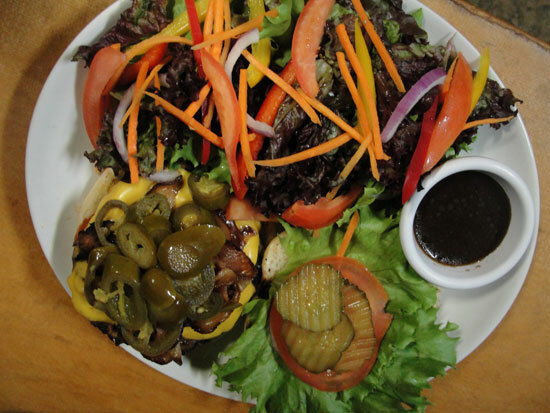 The BBQ Bacon Jalepeno Cheeseburger with a side salad. How good does that look? I like them topped the homemade chili on top! 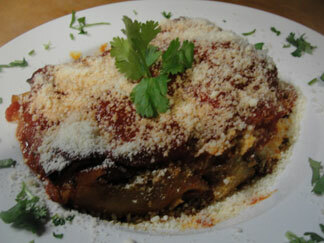 Their dinner menu is well-rounded and everything I've tried there is worth recommending. They have appetizers, salads, pizza, burgers, entrees, and dessert. I suggest substituting the espresso martini in place of dessert - it is so good! If you are in the mood for both dinner and music, I like going on Tuesday, Friday, or Saturday and arrive between 7:30 and 8:30. This ensures a moment to chat and get your orders in before the music starts up. Here are some of my very favorite things to order: Edamame with Sea Salt, the Giant Killer Nachos with Chili, Korean Tacos, and the Gorgonzola Salad. I have heard the Asian Glazed Pan Seared Tuna entree is good. 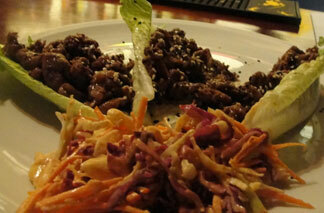 Let me elaborate on my favorite at this yummy Anguilla Restaurant: the Korean Tacos! The Korean Tacos are full of flavor and little kick of heat. The Korean style beef is served on top of hearts of romaine lettuce - there are 3. Sweet and fresh slaw is served on the side and is ideal on top of the tacos. YUM! I love this one. Another thing I love about The Pumphouse is there is something for almost any mood you may be in. The menu is varied. 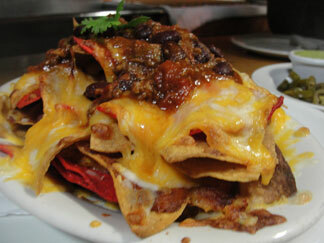 You can snack on the nachos or go for a full 3 course meal. There is something for everyone, any occasion, and all good. Another Pumphouse attribute? The people who work there! 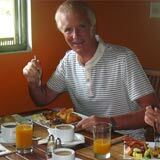 Nice, funny, and friendly people, with the quickest of wits, are on hand and ready to make you feel at home. Bartender Shenai is always welcoming and will be quick to share a laugh with you. Laurie (founder and co-owner mentioned above) himself is often on hand and can share fantastic stories about The Pumphouse, Sandy Ground, and Anguilla in general. Another special Pumphouse touch: the servers use tray service for everything. It's a unique touch to be sitting in such a casual environment but to have either your ice cold beer or steaming hot fresh fish entree brought to you on a tray. The only time you may not see the trays is later on a Thursday, which is the night that has a tendency to have the largest late night crowd. The servers constantly amaze me how they patiently maneuver the crowd to serve people. And Shenai does it with a smile on her face. The Pumphouse really has it all... It's so hard for me to imagine Sandy Ground before the Pumphouse days. It upholds its landmark status in an ideal way! Directions: Pumphouse is located in Sandy Ground village. Drive down to Sandy Ground and continue on the road that runs parallel to the beach. Pumphouse is on the pond side of the street. Good for bar-style dinner and music/drinks on Thursday nights. Hours: Nightly for dinner (closed Sundays).